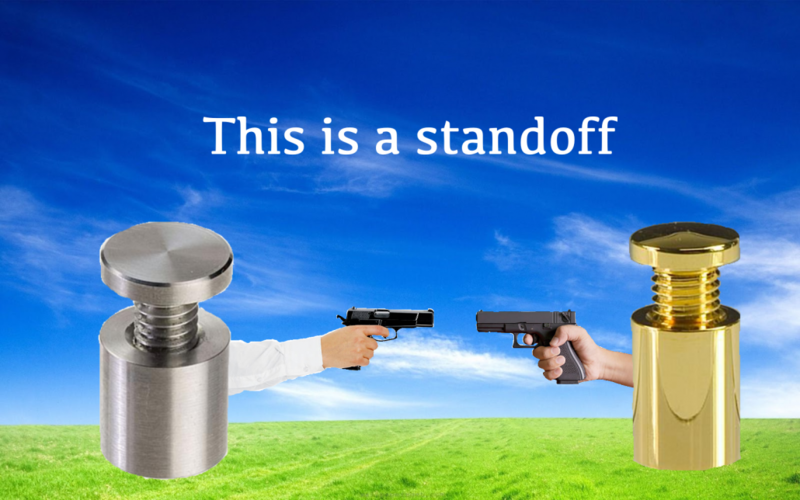 A standoff is a small piece of hardware that mounts and attaches a sign to a wall. The three parts of the standoff are the barrel, the cap, and the wall screw. A standoff allows a sign to literally “stand off” a wall and bring it forward. This type of threaded separator is sometimes used in conjunction with another similar piece of hardware called a spacer. A spacer is unthreaded and allows for an entire bolt to pass through. Standoffs can be male and female to fit together, and are typically made from aluminum, brass, or nylon. A hole is drilled through each corner of the sign and standoffs are threaded through the holes. There are also edge-grip standoffs for signs that can’t be drilled through, that hang your sign by its edges. Standoffs come in a variety of finishes and sizes. This metallic copper standoff is 1″ in diameter and stands 1″ off the wall. 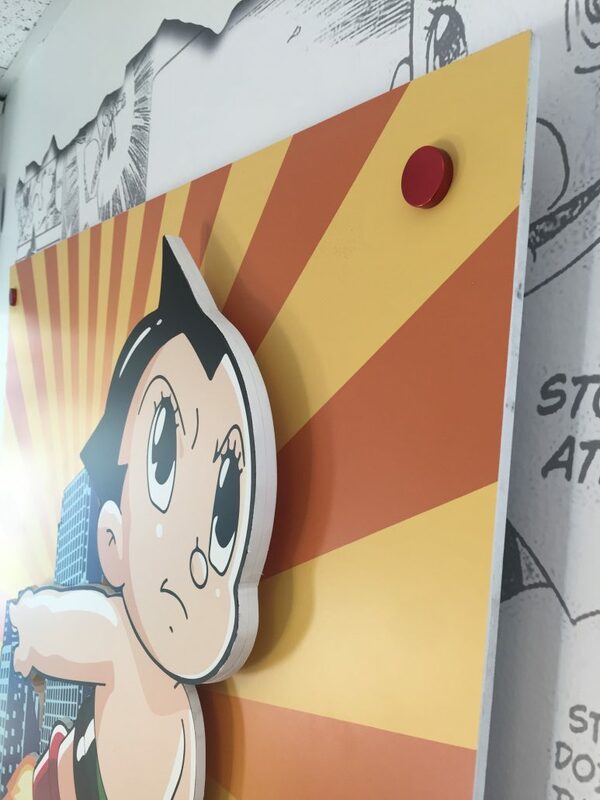 The sign has printed vinyl on the wall behind, plus both cut and printed vinyl on the clear acrylic panel, all mounted over a printed vinyl wallpaper for a striking, dimensional effect. 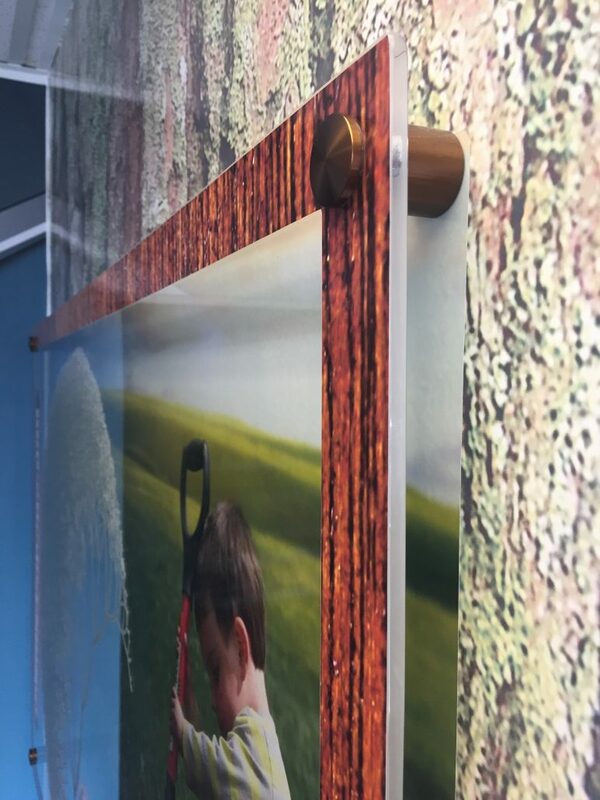 Standoffs can support relatively heavy sign panels so you don’t need to worry about them falling off the wall. They can be used to make any sign stand away from the wall and to add a professional look to your signs. They’re commonly placed in each corner of the sign to create the most strength and support. Though standoffs can be used with most signage materials, most often they are used with acrylic, aluminum dibond, and plastic. Standoffs are available in a wide variety of colors, finishes and sizes. Crisp metallic cut vinyl on a glossy black acrylic panel is accented with 1/2″ brushed metal standoffs. Other than signs, standoffs are most commonly used in the electronics field. They are put on top of the motherboard to separate the motherboard from the case to prevent an electrical short. There are also standoffs for LED signs, which are illuminated with LED themselves. 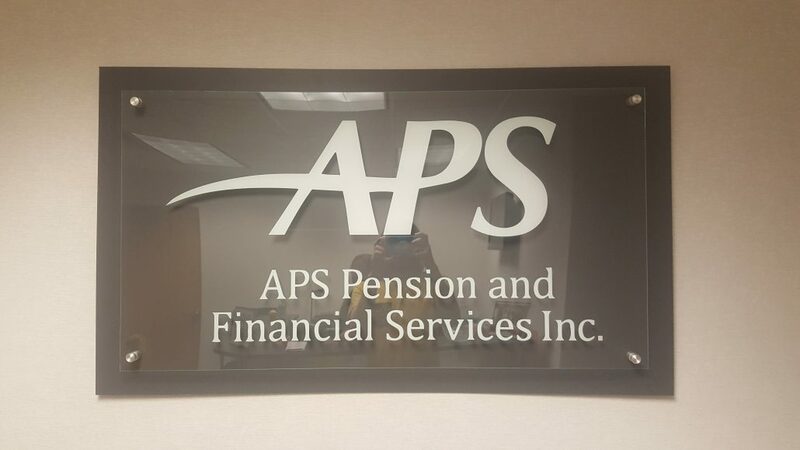 Clear acrylic with cut vinyl lettering backed with a second colored acrylic, using a double set of standoffs so both panels sit above the surface of the wall for a multi-dimensional sign. Standoffs are an elegant way to elevate your sign to the next level. Their minimalistic, unobtrusive design highlights the beauty of your sign, and helps it catch the eye. Signwave can help you choose just the right size, color, and finish for the standoffs that make your signs stand out. Standoffs come in all colors and finishes to ensure your hardware enhances the final version of the sign. “Close Enough” isn’t good enough when it comes to your brand. Good signage has to match a business’ brand — everything from the establishment’s overall aesthetics, to the packaging, even their ad campaigns. If signage and branding don’t match, then recognizability will suffer as a result. A sign might be highly visible, but it won’t “click,”if it doesn’t connect with the product or business. 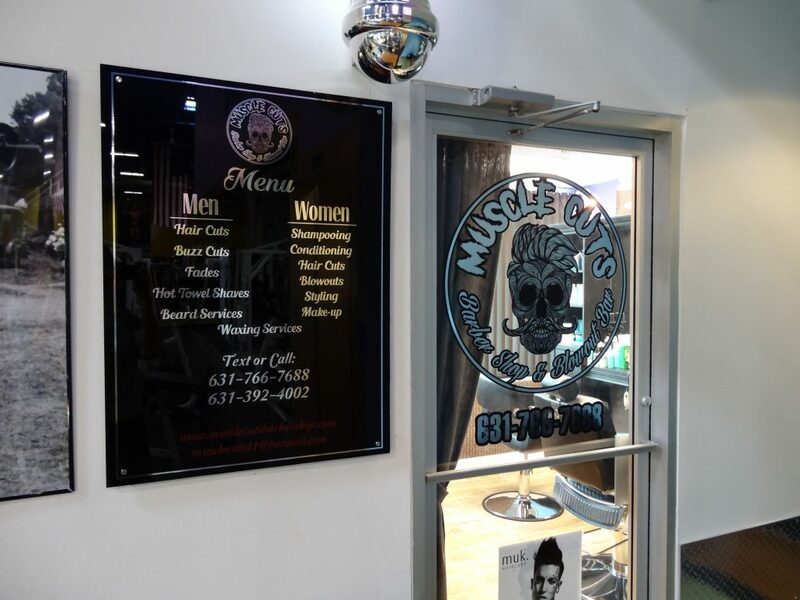 But when it’s done right, when the sign colors and style match the brand, your signage will stand out and bring the customers in. 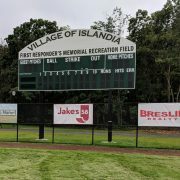 The Village of Islandia Baseball Field was built to honor the first responders of the 9/11 attacks. Signwave was honored to be asked to participate in the Grand Opening. 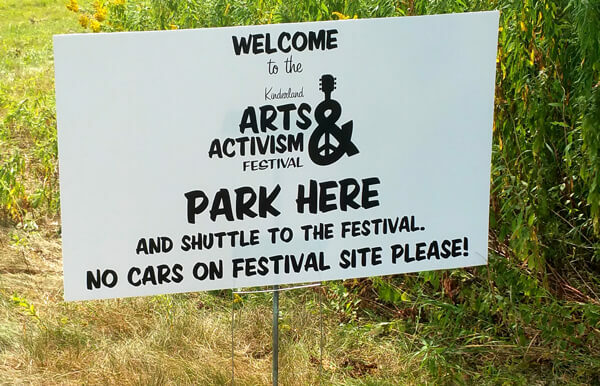 When Camp Kinderland needed help with event signage for a new arts festival, they called Signwave for the whole shebang. 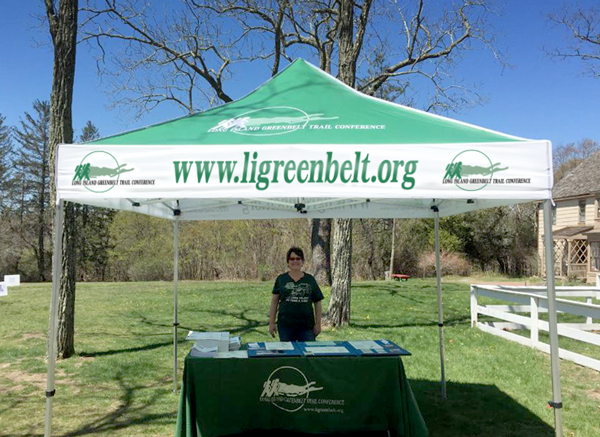 The non-profit children’s camp in Tolland, Massachusetts got the complete set: stage banners, directional and parking signs, feather banners, and custom pop-up tents for various vendors and sponsor tables. Some of the signage is in your face, promoting events, showing sponsors’ branding and channeling the festive look. Others are more practical and direct but just as vital, providing directions and details, and being dual-use as tents for vendors. All in all, they add up and help make sponsored events successful. Well thought-out event signage is a critical part of what makes an event successful. Sponsor branding needs to be visible to have an impact, to build association between the sponsor and the cause. But to have an impact, it’s not just about being big and bold or in your face. They have to leave a positive impression. So they have to be designed to have aesthetic functionality, to stand up above the rest, yet mesh well with a business’ brand identity and with its other signs. Signage goes hand in hand with consistent branding, after all. 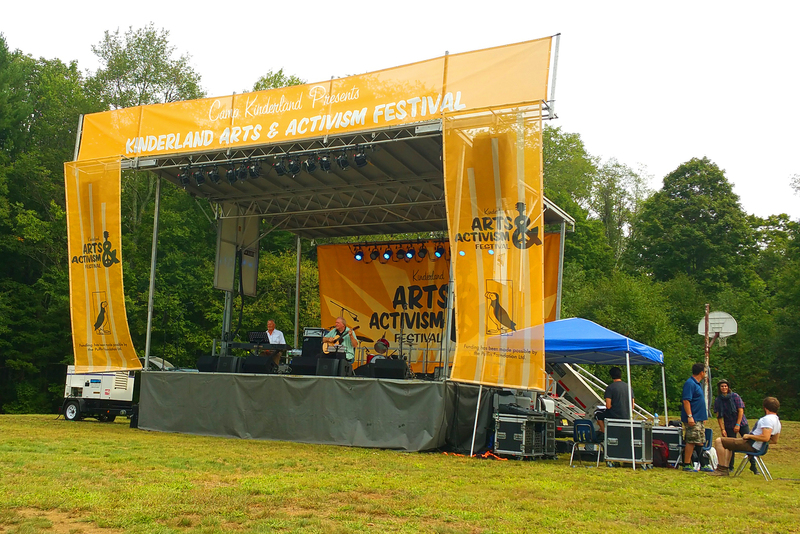 Sponsors need those for events, such as non-profit ones like Camp Kinderland’s Arts Festival. Corrugated plastic signs are perfect for temporary wayfinding at outdoor events. But event signage must take the attendee’s needs into account as well. Signs that indicate parking areas, entrances, exits, food and restrooms are all important. Traffic control, safety, and aesthetics are all pieces of the puzzle. This is where a sign maker’s art and craft blends with the comprehensive set of services provided by a sign company. Need a comprehensive sign package for an event? 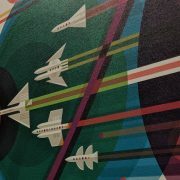 Contact Signwave so we can discuss your signage needs! Camp Kinderland is a summer camp located in Tolland, MA for children ages 8 to 16. 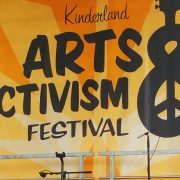 Kinderland’s mission is to cultivate values of social justice among its community, rooted in an awareness of history’s defining periods. Some events are forgettable. But we’ve all been to events that we remember years later. Something about the atmosphere that the hosts and planners created left a lasting impression. The approach to the event is critical. Guests need to know where to park, and where the entrance is found. The right signage can help build excitement before even entering the site. Once inside, your guests can be greeted with a wide variety of signage options. Consider banners commemorating the reason for the gathering. A “Step And Repeat” photo backdrop, containing logos of the sponsoring organization or sponsors is a must for guests to be able to create their own mementoes, or to assure the right publicity. 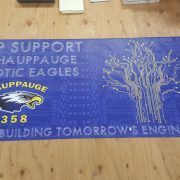 Custom printed table throws, easel signage, and posters are all elements to consider. If an outdoor event, banner flags of all sizes and shapes can enter the mix, as can custom printed tents and canopies. If there’s an event stage for performances or speeches, consider custom backdrops and other graphics. Give Signwave a call at 631-761-9292 for a free consultation. For retailers, compelling signage makes all the difference in attracting customers all year round. Depending upon the location and the type of store, you can offer a new promotion every month – and signage designed with changing sales seasons in mind can make sure that there’s always a relevant offer on hand. A case in point is our customer Towers Flowers, in West Islip, NY. After we designed the windows and interior signage for their new location, they came to us for a solution for changeable signage to display the many seasons of flowers. 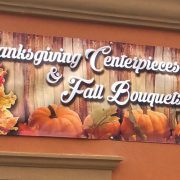 The florist business is a particularly seasonal one, and we came up with designs for the “big six” annual flower events – Thanksgiving, Christmas, Valentine’s Day, Easter, Mothers’ Day, and Graduation. After developing designs for these, we developed promotional signage for year-round and “off season” events, like weddings, funerals, summer parties, and birthdays, to fill in the gaps. Visual Merchandising that’s easy to change. To assure ease of changing as one season ends and another begins, we printed these signs on translucent vinyl and installed them on flexible acrylic sheets that could be easily popped in and out of their existing window frames. The windows were supplemented with changeable banners installed on a strategic wall, facing oncoming traffic, to assure maximum visibility. The window signs and banners are saved and reused year after year. 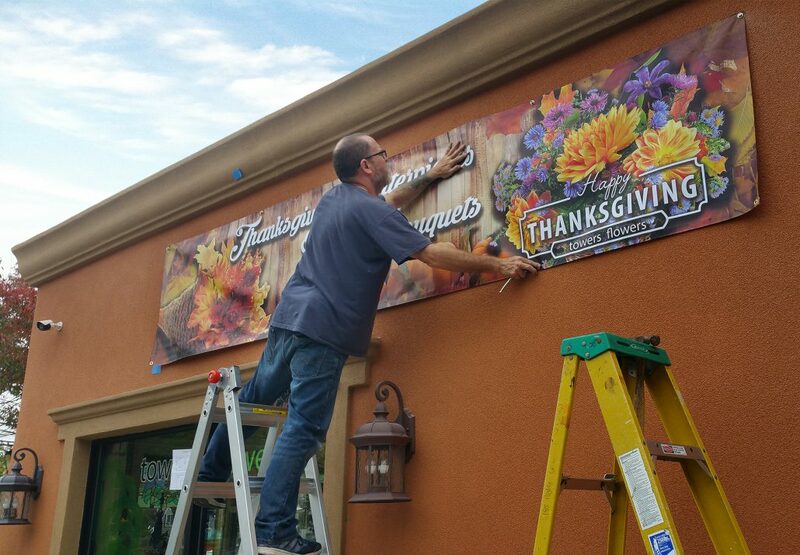 Signwave can help change your retail signage from stale to seasonal. Give us a call at 631.761.9292 to make sure that potential customers know what you’ve got in store. Signs are everywhere we look. Adhered to doors, windows, walls and floors. Hung from ceilings. Wrapped around cars, vans, trucks, boats, planes, skateboards and helmets. On poles in the ground, on brick walls, on edifices, on your desk or on your office building 600 feet off the ground. Signs are there to tell you what to do, where to go, how to get there, and what the rules are. Signs are the most effective, yet least expensive, way to tell the world about your organization or business. A sign is your introduction and handshake with those passing by, identifying your business to existing and potential customers. It is an opportunity to make a favorable first impression. Most businesses, regardless of size, rely heavily on signs. On-premise signs tell people who you are and what you sell. 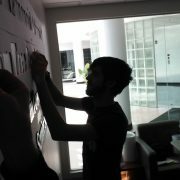 A sign is a critical piece of any business, and a good sign is a critical piece of a good business. We know that our customers are not sign experts, nor are we experts in our customers’ businesses. We will work closely with your team to create the right sign, using the right design, the right materials, on schedule, and on budget.